I've found some of the music of Gerald Finzi (1901-1956) to be quite interesting in the past. 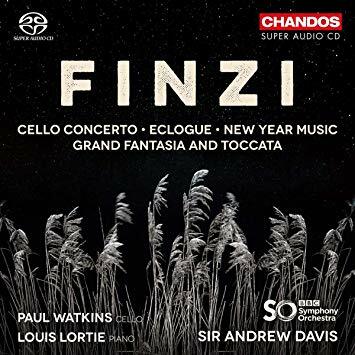 And now there is a new one by Sir Andrew Davis and the BBC Symphony Orchestra (Chandos 5214) that widens the window on the composer with some major works I have not heard before myself and perhaps you have not either. The Cello Concerto, Op. 40 (1951-52, 1954-55) is the centerpiece of the program, taking some nearly 40 minutes and featuring Paul Watkins nicely on the cello. Following the concerto are three worthy pieces lasting each around ten minutes, the Eclogue for Piano and String Orchestra (late 1920s, revised 1952), the Nocturne (New Years Music) (1926, revised 1940s, 1950) and the Grand Fantasia and Toccata, Op. 38 for Piano and Orchestra (Fantasia 1928, revised 1947, 1953, Toccata 1953). Finzi at least in my lifetime has been a somewhat lesser known of the 20th century English Renaissance composers. Since I do not know much about him I took a peek at Wikopedia. It tells me he is most known as a choral composer. He first studied with Farrar (who studied with Stanford), lost three brothers in WWI, had a rather bleak outlook in part because of that, and on from there. Vaughan Williams secured him a teaching post at the Royal Academy of Music (1930-33) and in the '20s Finzi made his first splash in London with his Thomas Hardy settings and an orchestral piece "A Severn Rhapsody." And so on... His major recognition and his very best works followed from the mid-'30s until his death. The music on the current program is in a kind of English Late-Romantic zone. I find the "Grand Fantasia and Toccata" to be the most engaging, for its harmonic tang and distinguished, adventuresome thematics. The Cello Concerto is a very ambitious work, surely. It follows a rhapsodic track in the first movement and gives much space for emotive cello pyrotechnical virtuosity. Wikipedia says this movement in part may reflect his diagnosis as he wrote the work that he had Hodgkin's disease and only 10 years left to live. It is certainly a bit gloomy. The second movement has a tender lyrical side that sounds nicely English pastoral. Towards the end of the movement a theme of real expressive beauty emerges full blown and we welcome it. Movement three is a true relief with a jaunty theme and a purposefulness that redeems the whole work and makes it graspable and worthwhile somehow. Nice. "Eclogue" for Piano and Orchestra starts right out with some lovely piano passages, some English sunshine and lyricism to contrast with some of the despair of the opening concerto. There is a diatonic kind of almost-folk art naivety to this music that engages nicely. "Nocturne (New Year Music)" is triumphantly rhapsodic and even a bit noisy. It is not my favorite here, though I like it far better when it is more quiet and reflective. So on this one we get a well-performed look at a somewhat mixed bag of music. The brilliant moments are worthwhile, and the rest will help the Anglophile with evaluate Finzi and his place in the English 20th century. It is good to hear. Some of it is rather wonderful.